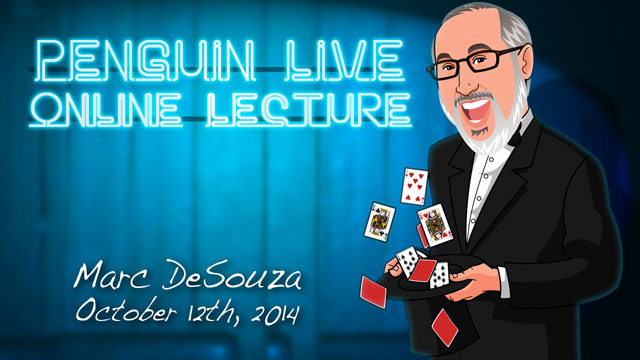 Today, when you order "Marc DeSouza LIVE", you'll instantly be emailed a Penguin Magic gift certificate. You can spend it on anything you like at Penguin, just like cash. Just complete your order as normal, and within seconds you'll get an email with your gift certificate. Marc DeSouza LIVE (Penguin LIVE) The Creation, Development, and Structure of Impossibilities. Plus, the Keys to a Successful Competition Act.SUPPORT LIVE MAGIC. DOWNLOAD THE FULL LECTURE TODAY. 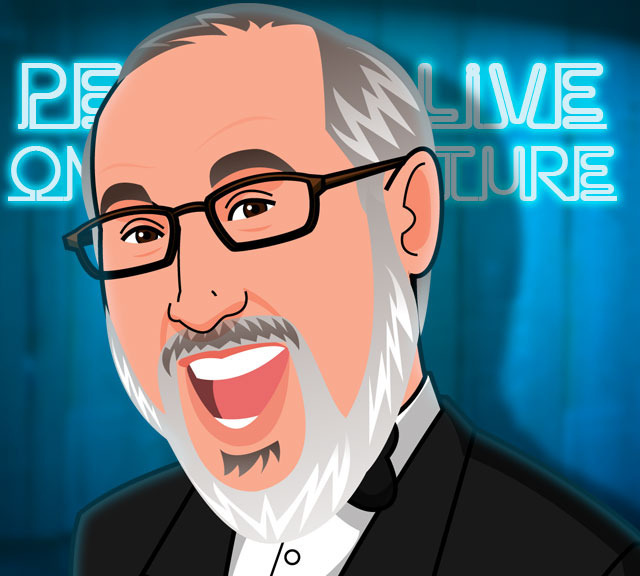 Marc will teach stand-up magic for both stage and club-style performances. The material is suitable for organizational and corporate work as well as, for the most part, family entertainment. Throughout the presentation, the focus will be on the creation and development of material, the structure of both the individual routines and the act, scripting and sources for more information. 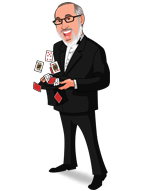 There will be a number of stories and pieces of advice garnered from over 50 years of experience in magic and his association with some of the finest magicians of our time. The evening will begin with the performance of a complete act, as though he were performing for a lay audience. The majority of the material is right out of his primary working repertoire and includes solo routines, audience participation pieces and mentalism. He’ll show how the Bill In Lemon serves as a piece that follows through the entire show with a series of call-backs. There is a “running bit” involving the Magic Square that goes through a third of the show and builds the impossibility of the effect. There are classic magic routines that have been brought up to date, such Al Baker’s Card In Chewing Gum. The twist in this version is that it is done with a card merely thought of. There is a wonderful Cards Up The Sleeve with a number of interesting nuances and a very commercial finish. There is a version of the legendary Bullet Catch done with an air pistol and steel darts that is dramatic, yet safe and easy to travel with. There are also alternate routines that will be demonstrated and taught such as the Rosini Thimbles, Linking Finger Rings, Bills Across and more. As if this were not enough, Marc will also discuss the subject of magic competitions from both the competitor and judge’s perspective. He will talk about the keys to a successful competition act. He will also demonstrate and teach a number of manipulative routines, some from his very successful competition act and some never seen by magicians. These include the Ball and Cone, Salt Pour, Ball and Rose Manipulation and Zombie. Marc DeSouza is a Philadelphia native with an International reputation in the Magic Community. As a performer, inventor, author, lecturer and motivational speaker, his talents have been displayed at gatherings throughout Europe, Asia, Australia and North America. In over fifty years of performing, his unique style has garnered him an impressive array of over 50 regional, national and international awards. Marc is the only two-time winner of the Society of American Magicians National Stage Magic Competition, in 1978 and again in 1989. 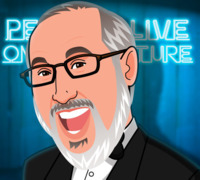 In 1995, Marc became the first magician in that organization’s history to win the prestigious Silver Medal in both the Stage and Close-Up categories. In 1993, he became the first magician in the history of the International Brotherhood of Magicians to place in both the Stage Magic and Close-Up Magic International Competitions in the same year. He is a three time IBM Gold Medal Finalist. In July of 1996, Marc made magical history again by winning both the SAM and IBM Close-Up Competitions, and a third Silver Medal from the SAM. As National Champion, Marc represented the S.A.M. at the F.I.S.M. competition held in 1997 in Dresden, Germany. This competition is held every three years and is considered to be the Olympics of Magic. This marketed his third FISM competition appearance. In 1996, Harper Collins engaged Marc to script, perform and teach all of the magic on their CD-ROM entitled MAGIC: An Insider’s View. This disk featured television star Harry Anderson introducing the various segments. He has also released four instructional videos for Magicians detailing his original work, as well as a book, DeSouza’s Deceptions, written by David Acer and published by Camirand Academy of Magic. In 2009, L&L Publications released a four DVD compilation of Marc’s creations and routines entitled Masterworks of Conjuring. This package represents over 30 years of work and the focus of this set is on presentations of magic ranging from close-up and parlor magic to magic for cabaret and stage performances. Marc has served as magical consultant for Marc Salem’s Mind Games, the highly successful Off-Broadway show and Enchantment Theatre Company’s national tours of Beauty and the Beast and Cinderella. As principal/owner of Merlin Marketing Group, Marc has combined his education and work experience in the field of marketing using magic to present products and messages in corporate and organizational settings. For business and sales meetings, Marc’s presentations focus on presenting the Unique Selling Points and corporate messaging of his clients to increase awareness in the market place and exceed business goals. Marc’s motivational presentation, Impossibilities, focuses on overcoming problems through unique solutions to achieve incredible goals. His basic premise is once you can achieve the impossible, you can achieve anything.....and he does just that! This presentation can be customized for virtually any corporate or business group or organization. Marc's talents have been in demand throughout the Mid-Atlantic area for performances at private parties, corporate events and gala affairs. He specializes in creating moments of impossibility right in front of your eyes… sometimes, right in your own hands. Philadelphia Magazine named Marc DeSouza the Best of Philly Magician in 1990, and has not so honored another since then. In February, 2001, Marc was one of twenty magicians chosen nationwide to perform as part of the Presidential Inaugural activities. His magic amazed and amused both Cabinet Members and visiting dignitaries. You too will be entranced by this unusual performer who blends humor, skill and mystery into MAGIC! Sit back and watch over 4 hours of DVD-quality live streaming magic from the comfort of your own home. And much more...But I'll let you discover those for yourself. Talk about a variety of professional material. It's all here. Get this lecture you won't be disappointed. Marc has done it all; knows more than most and gives generously. It shows in this lecture in quality and scope. Over 41/2 hrs of magical value, including the work on his platform show. He talks about structure and showmanship, shares deep secrets, and adds class to the classics. If you know Marc, you know you need this; if you don't know him, start here. All the best magicians in the world make a point to know Marc, start learning from him now. Marc DeSouza is one of the greatest performers, teachers and scholars in all of magic. This lecture is 280 minutes of pure gold for any magician. After putting some of Marc's ideas into my own act, I immediately got great audience response. Do yourself a big favor and get this lecture today! This is a must lecture if you are an entertainer & performer! Pull up a chair for 4 & 1/2 hours of jam packed real-world magic. The best of the best. Small investment for a huge return. I have had the pleasure of seeing Marc lecture several times in the past, but this lecture has topped them all! It was true genius on his part to perform a full evening stand up show of many classics of magic and then go into full explanations of everything he presented. His expertise and knowledge of the material performed and taught was priceless. One of the best Penguin lectures by far! I really enjoyed Marc's lecture a lot. He went over so many great classics of magic as well as gave some unreal tips on performance. The best part of this lecture was EXACTLY what I have been asking for since day 1, he gave a FULL show and didn't hold anything back. He did the full show, that he uses professionally and discussed the WHYS of certain choices. We have too many tricks out there, in your junk drawer you probably own enough for 3 careers in magic or more. What we don't see enough of are FULL UNCUT PERFORMANCES of a full set. We are so commonly force-fed single trick DVDs and along the way we missed something: the greatness of seeing a professional transition from piece to piece or string out a full routine like Marc's Bill in Lemon. With that said, he went over some of my favorite tricks... The Egg Bag, The Bullet Catch, Bill in Lemon, Professors Nightmare and sooooo much more. Including a REALLY practical billiard ball routine that was really nice (I'll be working on a couple of those changes). Do yourself a favor... If you are new to magic, or overwhelmed by the massive amount of products out there... BUY THIS LECTURE and study it. It's all you really need to hear to have a long and successful career. "Approach magic as a professional"
Thank you for sharing Marc, you are awesome! One of the most enjoyable lectures I've seen! Marc DeSouza came well-prepared with real, workable material. He is a very likable, genuine guy with a keen eye for details. He explains his material well and makes you understand the process of the tricks evolution and the logic behind his routines. I loved how he began the lecture with his platform show as a layman would see it. Afterwards, he broke down each effect and went into greater detail - a really great format for the lecture. More importantly, you get to see a full show, choreography, audience management as he flows smoothly from one routine to another. He speaks on making a good impression at the beginning and end of the show, establishing character and earning the audience's admiration. Excellent set list, callbacks, humor and quality material - what more can you ask for? Highly recommended! This is the greatest lecture if gotten so far. BRING HIM BACK!!! This is a must-get. Marc teaches so much material, show structuring, packing, setup, and much more. This is truly a gem!